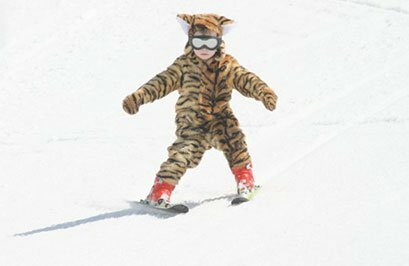 At what age should you take your children skiing? It can happen like that, and when it does there’s nothing better, but there’s a lot of work along the way before you arrive at that stage. Children can start to ski a little at two, if they are confident, co-ordinated and relatively fearless. Boys seem to take to it earlier than girls, perhaps because they don’t have the intelligence to imagine how much careering into a tree could hurt! But you need good weather, good snow, a very gentle nursery slope and lots of time and patience, one to one. They can manage about an hour per day, probably at lunchtime, when the weather is warmer and the slopes at their emptiest. Possibly the best preparation for skiing is tobogganing. The combination of speed, terror and lack of control is good practice. Beware, however: sledges are faster and more dangerous than skis. You need to pick your slope very carefully! When two year olds are ready to start skiing, don’t be fobbed off with plastic imitations of skis: they should have proper little skis and rear-entry boots, but will not need poles. They must have sunglasses or goggles. They probably won’t be skiing fast enough to crash hard by themselves, but could always be fallen on by a twenty-stone beginner, or hit by a drag lift, so a helmet is essential. Two-year olds will probably start by being pulled along the flat, holding the end of one of your poles. After half an hour or so they’ll be ready to be carried or dragged a few yards up a gentle slope, and allowed to slide back into the arms of Mummy, or someone else in whom they have total confidence (probably not Daddy!). From as young as their third birthday, children can learn to go up the drag lift and ski back down in gorgeous little parallel turns, though still only for about an hour per day. A parent can help with the initial stages, such as getting used to the drag lift. You put one of your skis between the child’s, put the drag between your own legs, and push the child along with your leg. But most parents are survival skiers, getting down the piste in spite of their technique, not because of it. Children learn largely through imitation so they need someone technically perfect to copy. If you can get an instructor from your own country, it makes life a lot easier. Children find even practically bilingual foreigners very confusing. The easiest way for them to learn is with a private instructor per child. This is very expensive. You can halve the price by sharing the lesson between two children, but with two tiny beginners an instructor spends most of his time rushing between them, preventing wipe-outs and tantrums. It costs half as much, and each child learns a quarter as much and enjoys it a tenth as much! Ski holidays are expensive, but if you want your children to learn to ski and be happy there is no alternative to spending a bit more. Once your child can get on and off lifts alone, you can start thinking about shared lessons or even ski school, so long as classes are small and lessons relatively short. But don’t rush them. Skiing is only meant to be a bit of fun. If they are as happy tobogganing or building a snowman, let them. 1) take the child to the ESF for a half-day test lesson from 09.30-12.30 or 14.00-17.00. If the instructor thinks the child is up to it, he or she will be accepted into their children’s gardens (Jardins des Neiges), which they advertise as being for 4-5 year olds. The ESF has one on the nursery slopes, and another at La Daille, but classes can go up to 6 children per instructor, or 8 during French school holidays. The prices are listed on the ESF page on this website, but you can spend quite a lot per hour for an eighth of an instructor. Private lessons on the other hand, depending upon time, date and demand, sound like a better investment. Lunchtime is the cheapest time. 2) Evolution2 do not accept 3-year olds in group lessons, but their private lessons over lunch or in the afternoon are reasonable. If you manage to get Valérie or someone like her your child will enjoy his or her holiday as much as you do, and probably end up skiing better than you! 3) take a private lesson with one of the boutique ski schools, where you are very likely to have a British instructor whom the child will probably understand more easily, or a freelance private instructor specialising in teaching children. Mountain Masters, subject of course to availability, offer one or two-hour private lessons, normally in the afternoon. Tansy is absolutely brilliant with small children. The Development Centre (TDC) offer three-hour private lessons. Progression recommend booking an instructor between several of you and allowing the child to take as much of the lesson as he or she wants, and New Generation offer two hours. Yann Le Bozec is a one-man ski school who is also brilliant at teaching children. 4-year olds vary hugely. Some will schuss black runs. Some will sit down and cry. Most can learn to go up the baby drag lifts on the nursery slopes and the basics of skiing. If your child is going to ski, getting a good instructor is the secret to a successful holiday. There are comprehensive descriptions of all Val d’Isère’s ski schools on this website. Contact the ski schools as early as possible to be sure of a place in the right class or, if you are reserving a private instructor, to get their best person. Fiona Easdale in our UK office knows a number of excellent teachers. Even at four years old, lessons will only last about two hours each day, so unless parents of small children have help, most of their holiday will be devoted to child-minding. Ski lessons must be booked in advance. For full details of both Childcare and Ski Schools please click on the links given.